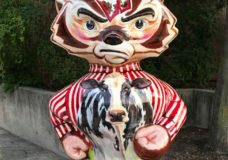 I anticipated an uncomplicated day ferreting out Bucky—snag Bucky at the zoo, swing toward Lake Monona, then head east. 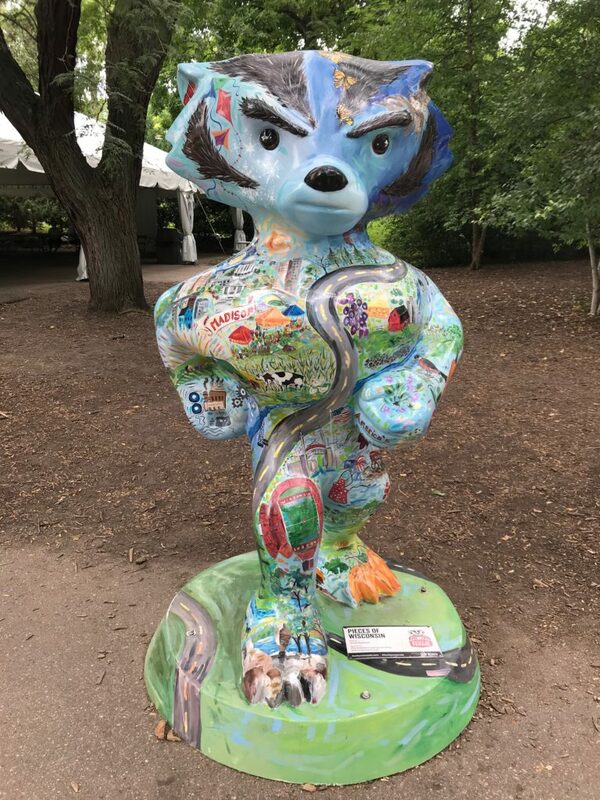 I should have realized that expediency would not be the order of the day when I discovered that Bucky was not outside the zoo, but inside. Once again, I was challenged by lack of parking, but a car backed out and I slipped into his spot. 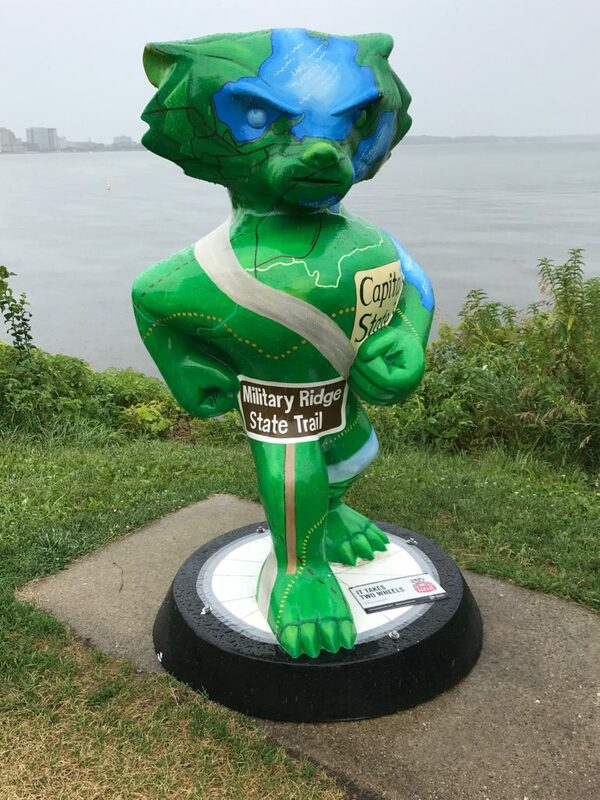 I traipsed down the hill toward “Pieces of Wisconsin” Bucky, a roadmap of farms, lakes and industry. Since I was close to the polar bear exhibit, I thought I could finally catch a glimpse of the polar bear. Once again, no polar bear in sight. I trudged back up the hill toward another favorite, the lions. Exhibit closed. I checked my Bucky map and headed down Park Street toward the listed address that coincided with the UW Space Lab. Rain trickled on my windshield as I verified the address and pulled in front of the building. No Bucky. I entered the building, but no one was in sight so I headed downstairs. I yanked on the door handle to the Space Lab. Locked. I heard voices down the hall and stumbled upon a classroom of children. I edged along the wall and entered the Space lab. No Bucky. A young man stopped me and told me I wasn’t supposed to be there. I explained how I was told Bucky was there and my map said so. He hadn’t seen Bucky. 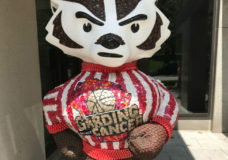 As I left the building, I passed a closed office with a sign on the door, “Bucky is located by McDonalds.” But where is McDonalds? By the time I found McDonalds, rain splatted my windshield. 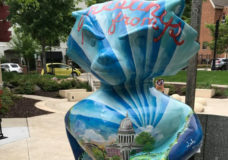 I grabbed my umbrella and crossed the street, spotting “All Hands on Bucky” spattered with handprints courtesy of children from the Milwaukee Sign Language School. 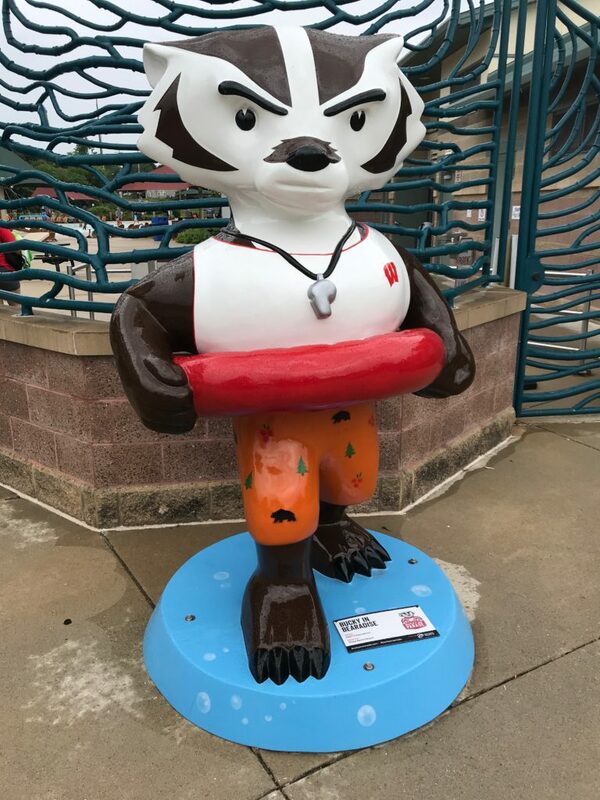 At the Goodman Pool, “Bucky in Bearadise,” sports swim trunks and an inner tube, but found little company amid the drizzle. 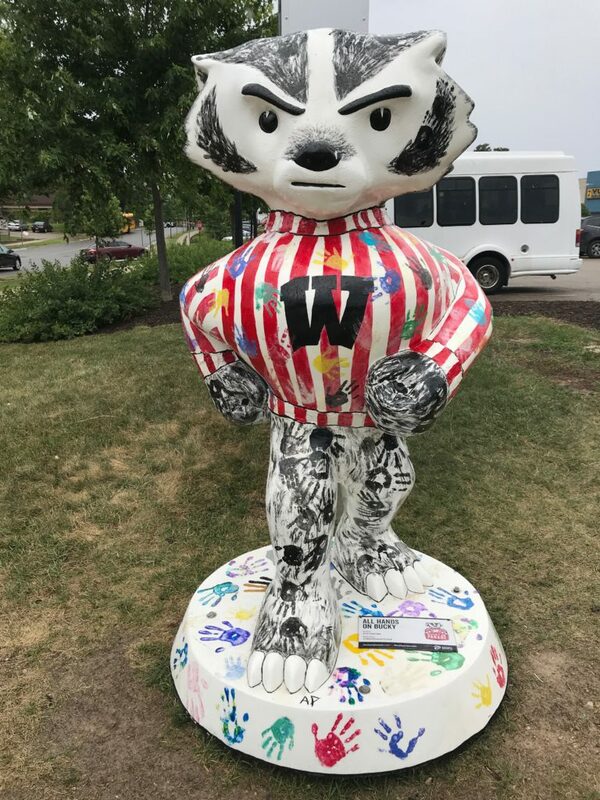 Okay, could they not make Bucky more visible??? Raindrops tapped at my umbrella as I walked down the asphalt path along the lake. “It Takes Two Wheels” Buckystands on a bike tire and highlights the area’s bike trails. 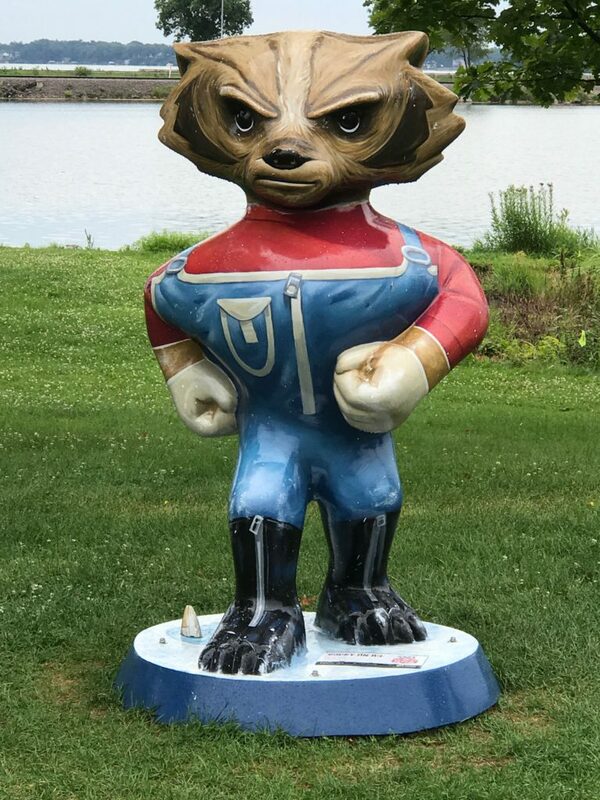 At the boathouse on the North Shore, I once again asked for directions to Bucky. I’m directed to “Bucky on Ice” ready for ice fishing season, minus his sabotaged fishing pole. 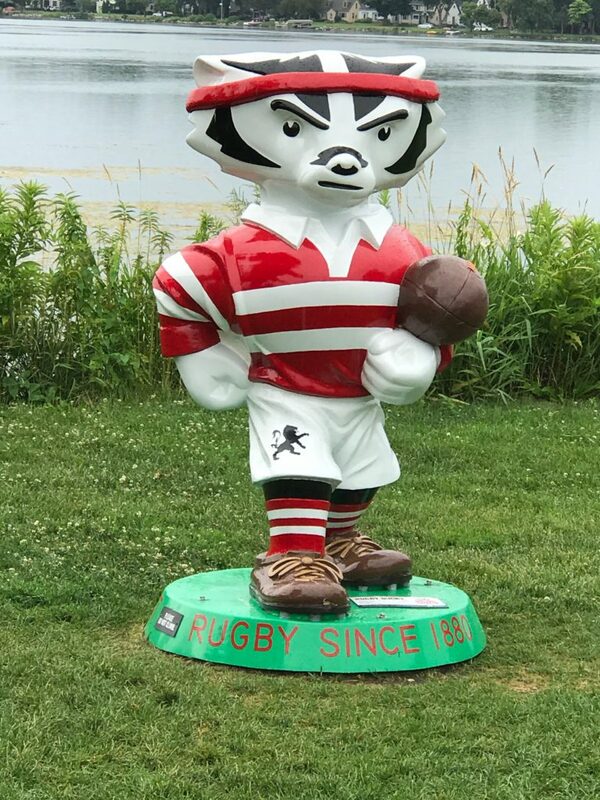 I backtracked through road construction to Brittingham Park in search of “Rugby Bucky” celebrating UW rugby since 1880. I continued my mission to McPike Park. Blinked twice and missed it. I turned onto an asphalt path and drove to the far end. 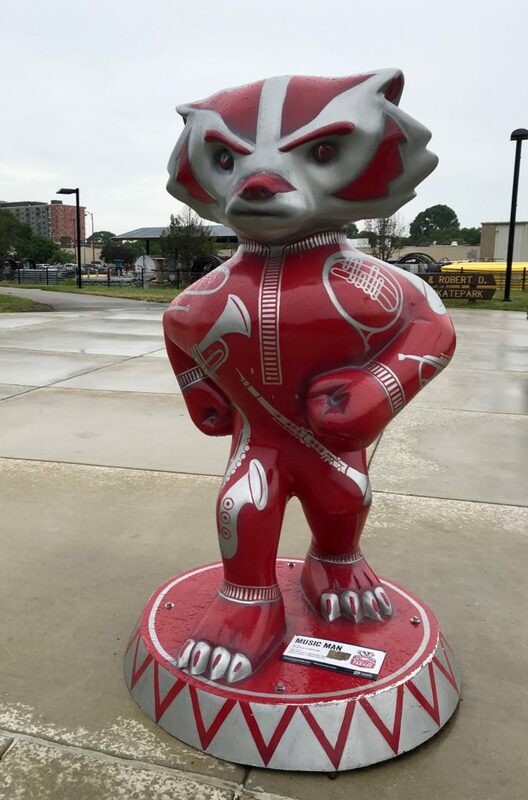 At least the brass instruments painted on the body of “Music Man” Bucky wouldn’t rust in the rain. A couple with a dog strolled along the path I had just entered. Whoops. I think I drove on a walking path. I swung around the loop and exited. 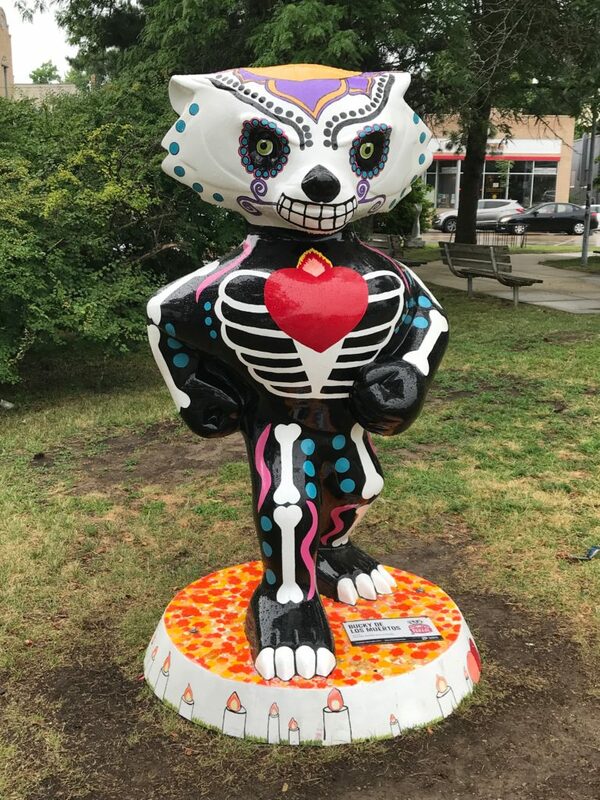 Last stop, Monty’s Blue Plate Diner featuring “Bucky De Los Muertos,” or Day of the Dead, a Mexican celebration honoring their departed loved ones. 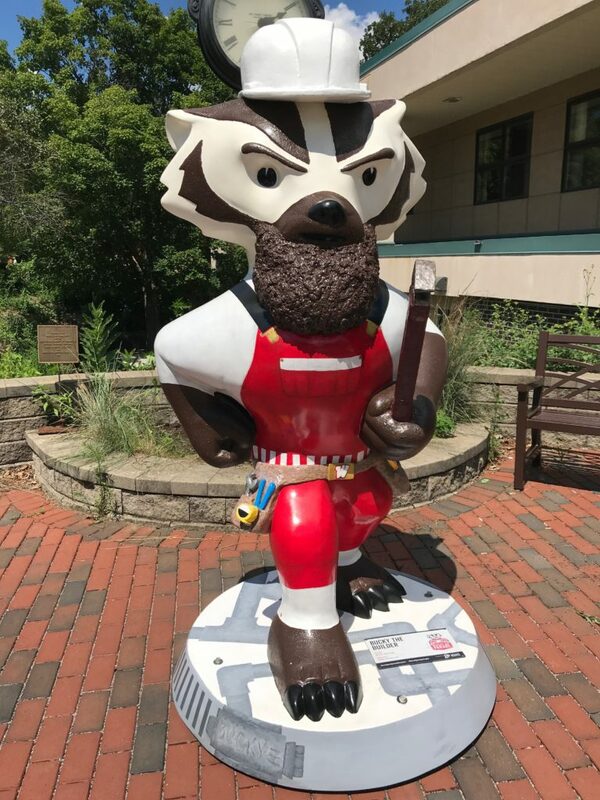 Standing in front of the 1856 clock, full-bearded “Bucky the Builder” sports a hardhat and tool belt. After a couple of appointments, I took a detour to MATC. I pulled into the only available parking space right next to the meter police. 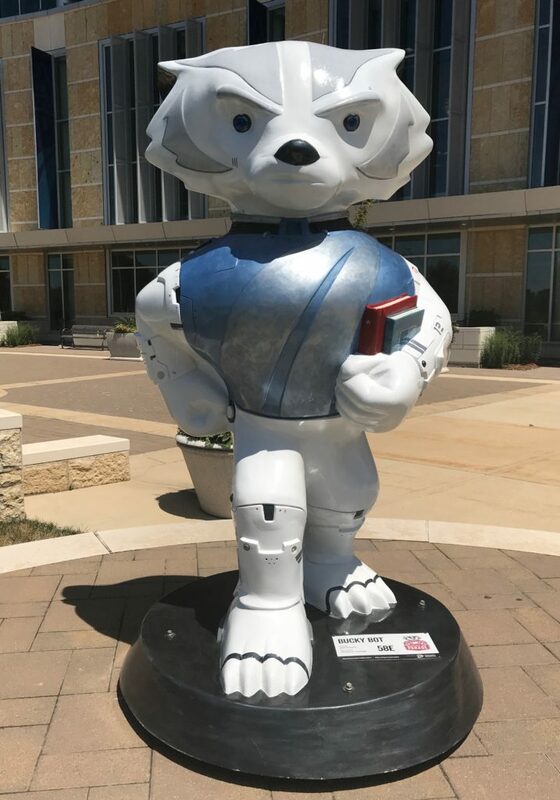 Seeing a possible ticket in my future, I plugged the meter, walked down the sidewalk and up the stairs with the sun beating on my face and snapped “Bucky Bot,” a superhuman futuristic Bucky in his mechanical suit. 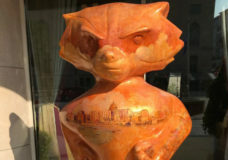 I wound my way to the Goodman Center for “Our Hearts Belong To Bucky,” a mosaic pattern overlaid with red hearts. Of course my #1 favorite is Bucky the Builder. I finally got a photo of him with his twin, my son Kirk the Builder. 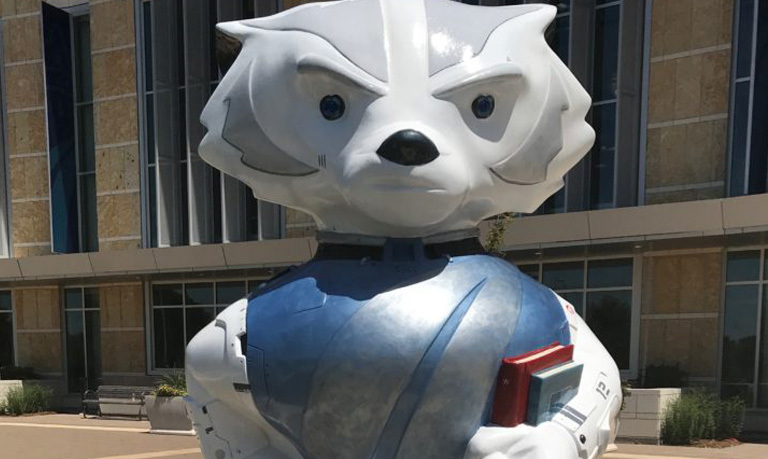 But a very close second is “All Hands on Bucky.” What a great concept. 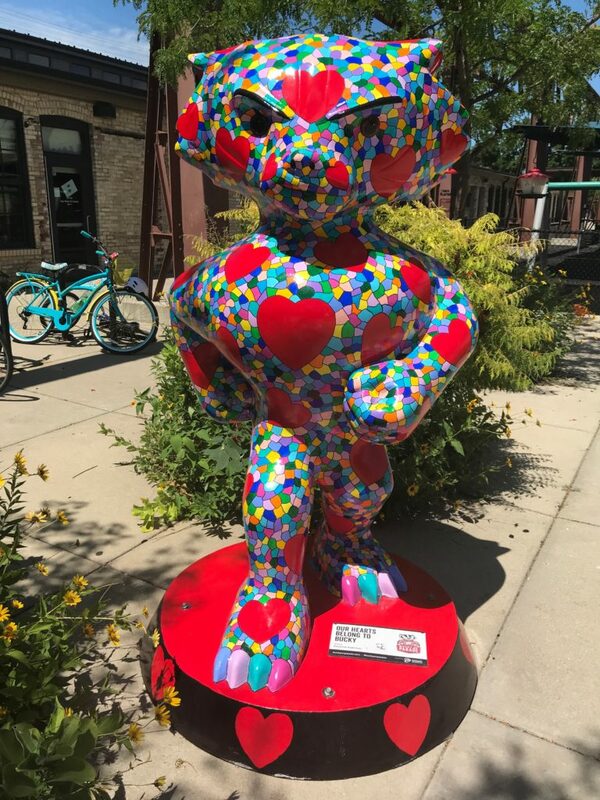 My favorite is the bright and colorful Our Hearts Belong to Bucky. Thanks for sharing your adventures, Joanie!